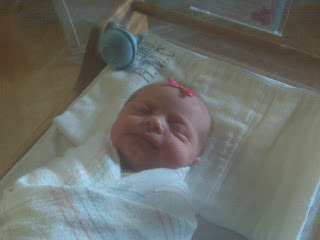 Cindy and Russ' Blog: New Niece! My sister, Stacey, had her 5th child today. A baby girl (after 4 boys) they've decided to name Abigail Ann. She was induced exactly 4 weeks early because of antibody problems. Despite being 4 weeks early, she weighs 6 pounds, 3 ounces. (Dylan was born a week before his due date and weighed only one ounce more.) I think she looks a lot like her dad, complete with the dimpled chin. Guess that means Bryce would have made a cute girl. :) Congrats Stacey and Bryce! How ironic, my brother had his 5th on the 2nd and it was a boy after 4 girls. Congrats to Stacey!